Join us for the Statera National Conference in New York City from October 25-27, 2019. Meet with theatre professionals from all over the country for three days of networking, learning, listening, socializing, experience-sharing, theatre-going and more! The Statera conference is all about intersectional gender balance and our goal is to take positive action to bring women* into full and equal participation in the American Theatre. Why are we meeting in NEW York City? StateraArts is proud to partner this year with City College of New York and the Department of Theatre and Speech (CCNY) for our fourth international conference. 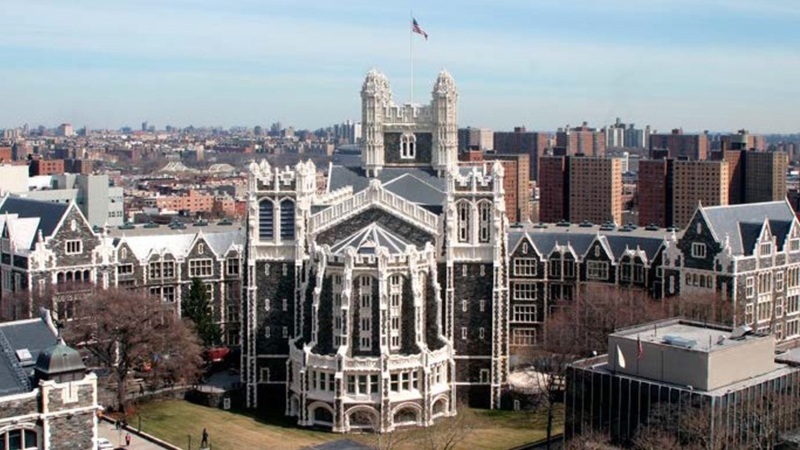 Since its founding in 1847, CCNY has been true to its legacy of access, opportunity, and transformation. CCNY is as diverse, dynamic, and boldly visionary as the city itself. Located in Hamilton Heights overlooking Harlem, City College is an integral part of the civic, urban and artistic energy of New York and inseparable from its history. Statera Conference is open to all theatre professionals, practitioners, students and enthusiasts regardless of gender or age: administrators, designers, dramaturgs, educators, technicians, actors, advocates, spouses, etc. Please visit www.stateraarts.org/community for a full list of past conference speakers, facilitators, performers, contributors, and partners. Joanna Gleason will be delivering one of the keynote address at Statera's 4th National Conference on gender equity in the theatre. Joanna is revered by Broadway audiences for her unforgettable portrayal of The Baker’s Wife in the original company of Into the Woods. Other Broadway credits include Dirty Rotten Scoundrels, Nick and Nora, Day in the Death of Joe Egg, and Sons of The Prophet among others. Her extensive film and TV work includes Boogie Nights, Crimes & Misdemeanors, Hannah and Her Sisters, Mr. Holland’s Opus, The Wedding Planner, The West Wing, ER, The Good Wife, and a host of other projects. Joanna has been teaching in high schools and colleges around the country for thirty years, and has directed Off-Broadway as well as for television. Registration includes access to all Statera Conference programming. This includes keynote addresses, plenaries, workshops, breakout sessions, panel discussions, admission to organized social gatherings, and a conference swag bag. Early Bird Registration ($250) closes on April 30th at midnight EST. General Registration ($300) begins on May 1st. 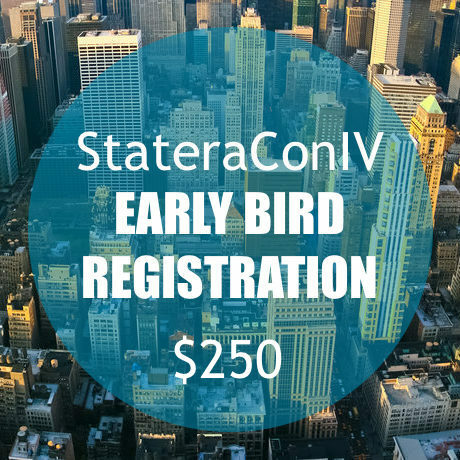 Statera Members receive the early bird rate as long as registration is open. Please read the StateraCon Refund & Cancellation Policies before registering. We love when students join their professors at StateraCon! If you are a student attending Statera's National Conference in New York City with your professor, your attendance fee is cut in half. Your professor will need to confirm that you are their student. Please read the StateraCon Refund & Cancellation Policies before registering. Touchstone speakers will be announced in the coming months. We will announce presenters in June and July. Interested in presenting a session? Visit www.stateraarts.org/proposals. Presenters will be notified by June 1, 2019. April 30, 2019 - Nominations for the Martha Richards Woman in Leadership Award close at midnight EST. May 1, 2019 - General Registration ($300) opens. May 1, 2019 - Breakout Session Proposals are due by midnight EST. June 31, 2019 - Grant Applications close at midnight EST. July 15, 2019 - Grant recipients will be notified. September 30, 2019 - General Registration ($300) and Student Registration ($150) closes at midnight EST. We anticipate selling out before then, so register early to secure a spot. October 1, 2019 - Late Registration ($350) opens until sold out. The first way in which StateraArts offers financial assistance to all conference attendees is to keep our registration fee low. We also understand that many attendees need further financial assistance in order to attend conference. StateraArts is excited to offer a limited number of travel grants and registration fee waivers for women* in need. Interested in applying for a conference grant? Please visit www.stateraarts.org/conference-grant-application for more information. The deadline is June 31, 2019. The Statera National Conference is a families-welcome space. This year, we are working in close partnership with the Parent Artist Advocacy League (PAAL) to make sure our parents have what they need at conference. We know that many theatre artists, particularly women, are juggling their professional lives with the needs of their families (we can relate!) To help ensure that you won't need to choose between attending the conference and caring for your little ones, we will have a Family Room* available for any attendees needing to bring their infants or small children with them to conference. This room will be equipped with private space for nursing and pumping and plenty of room for little ones to get the "wiggles" out! Attendees may bring their small children into the sessions with them as they see fit. Also, please feel free to breastfeed in any of the sessions. Any attendee wishing to bring a babysitter to conference with them to attend to their kiddos while they attend sessions is welcome to do so without registering and paying for their babysitter. Simply note the names of your children and their babysitter when you complete your conference registration and we'll print name badges for your family group so that they have easy access to you during conference. Looking to coordinate childcare or want to connect with other parents at the conference? Statera and the Parent Artist Advocacy League (PAAL) are here for you you! Please reach out to our liaison Rachel Spencer-Hewitt directly at www.paaltheatre.com/contact for more information. There is also a place in your registration form to note your needs. *The family room will not be staffed by StateraArts personnel and children may not be left unattended at any time. StateraCon is an open and inclusive gathering. And we feel that words matter. We will provide a variety of pronoun stickers for use on your conference name badge. Stickers will be available at the registration table every morning of conference so that you may choose how to identify. All conference spaces are ADA accessible. Statera will arrange for ASL translations for those who need it. Gender neutral bathrooms are available and well-signed. Please contact the Statera Team at conference@stateraarts.org if you have accessibility needs (ie. large print materials, assistive technology, mobility needs, etc.) We are here for you. Will StateraArts be hosting performances during conference? NYC is a treasure trove of incredible theatre experiences and we are keeping evenings free for attendees to make the most of their time. Space is at a premium and StateraArts will not be hosting performances during conference. We will provide a list of available shows when the conference draws near. Your registration fee does not include transportation, theatre tickets, lodging or meals (unless otherwise noted on the itinerary). The conference schedule is subject to change and we will be adding the names of speakers and details about content in the weeks and months ahead. Questions or concerns? Please contact us at conference@stateraarts.org.